There are 11 posts in this thread, and it has been viewed 8706 times. Fatal Fury: Wild Ambition. What do you think of it? At the very edge of bankruptcy in 1999 the original SNK corporation let out the 'legendary hungry wolf' for one more time - but this time in 3D! Of course we're talking of the rather tragic Fatal Fury: Wild Ambition. 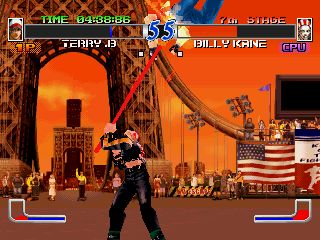 Alongside with Garou: Mark of the Wolves it marks the end of the original Fatal Fury series. With rather optimistic than wild ambitions SNK wanted Terry Bogard and his friends to shine in a new splendor, while preserving the gameplay of the previous 2D predecessors. So now you're asking yourself if SNK was able to manage the split between polygons and traditional gameplay? Most players tend to disagree, pointing at the sloppy, rather dull animations and not so exciting fights. Anyhow, on the other side the game offered excellent artwork and a even better soundtrack. Check it out by occasion! 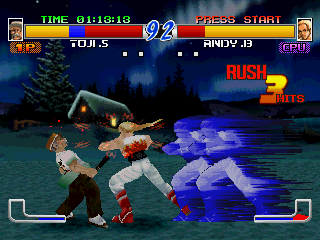 Fatal Fury: Wild Ambition is a 3D fighting game released in 1999 as part of the Fatal Fury game series. 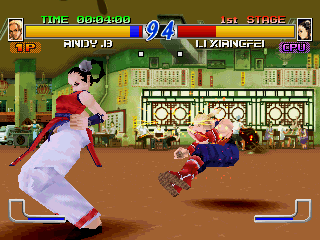 It was one of the last games with the system board Hyper Neo Geo 64, and was later ported to the Sony PlayStation. This game is a remake of the first Fatal Fury, making the events that happened during the first game (like Geese falling from his tower to his apparent death) non-canon. 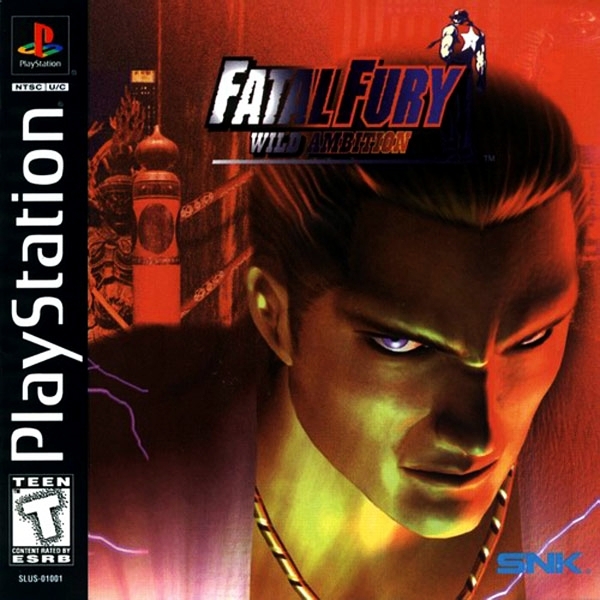 atal Fury: Wild Ambition is a 3D fighting game, but gameplay is similar to that of a 2D fighter. The button layout is the same from Real Bout Fatal Fury 2, but the D Button is now called the Axis Shift instead of the Line Sway. If anyone's in posession of the Hyper Neo Geo 64/PSX version, why not? Just let Murikov or Priest know or leave an according post in this thread. Great game. I prefer the HNG64 version and the music is amazing. Never played it, but the art looks good and the game play seems like it could be fun. Really like how you can trade blows with Mr. Karate ( Ryo ) at the end. It's a shame the Ryo didn't use the Tengu mask, like his father. LIFE_IN_2D wrote: It's a shame the Ryo didn't use the Tengu mask, like his father. Actually, he does, but in a winpose though. Total crap! I remember when I spotted this for the PSX... I bought it... brought it home... played it... then cried myself to sleep. Its a neat title, but it never left a lasting impression on me. Again, its not terrible, but its not doing anything that makes it stand out from other Fatal Fury titles. The music is awesome, though. I bet the PSX version isn't that great compared the the real hardware of the Hyper Neo Geo 64. The PSX version is fine. It isn't 'quite' as smooth as the HNG64 versions, and some of the graphical effects look better on HNG (flame and special move effects etc) not to mention, loading times present on the PS1 release, but for someone like me who doesn't want a HNG64 set-up, the PS1 disc suffices perfectly. 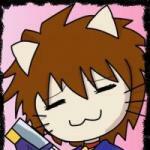 If the HNG version is 100% the game, then the PS1 version is 92%. The HNG version just looks nicer. That's all. Anyway, yeah... I think this game is average. It's not bad, but I wouldn't call it good either. For example, I don't think it is as well executed as it's main existing rival of it's time; the SFEX series. They were very well executed (love or hate them), played well in their own right/universe and were very smooth. It was a nice alternative to SF in 2D, but not a replacement. As I feel that WA is average, I felt the SFEX titles were actually good. Not amazing, but good nonetheless. Never played this, probably wont got out of my way to either. This game reminds me of a Fatal Fury game I DO want to play,very much. Real Bout : Dominated mind, anybody know the best was to play this... without tracking down the PS1 game?